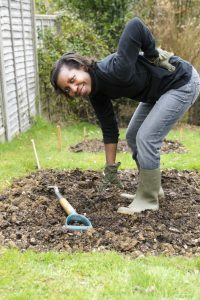 The American Chiropractic Association recently posted some great tips for making sure you don’t feel worse for wear after gardening this spring and summer (Read the article from the ACA: HealthyLiving_Gardening). Try these stretches to help your body prepare for a day spent in the garden. While sitting, prop your heel on a stool or step, keeping the knees straight. Lean forward until you feel a stretch in the back of the thigh, or the hamstring muscle. Hold this position for 15 seconds. Repeat on the other side. Stand up, balance yourself, and grab the front of your ankle from behind. Pull your heel toward your buttocks and hold the position for 15 seconds. Repeat on the other leg. Wrap your arms around yourself and rotate to one side, stretching as far as you can comfortably go. Hold for 10 seconds and reverse. Repeat two or three times. Our goal here at Absolute Wellness Center is to make sure you keep doing what you love. Gardening is so much fun, so make sure you do it in a way that keeps you out there for many years to come. And if you have any crinks or pain that are causing you concern, we are here to help. If you’d like to learn more about conservative pain management at Absolute Wellness Center in Eugene, OR, give us a call at 541-484-5777. We also offer chiropractic medicine, sports medicine, physical rehabilitation, acupuncture, and massage. Don’t let pain keep you from doing the health, fun, outdoorsy things you love.